Hello! My name is Troy Disabato and I’m a homegrown boy that grew up in the little town of New Lowell and attended Stayner Collegiate High School and started a career as a PSW. 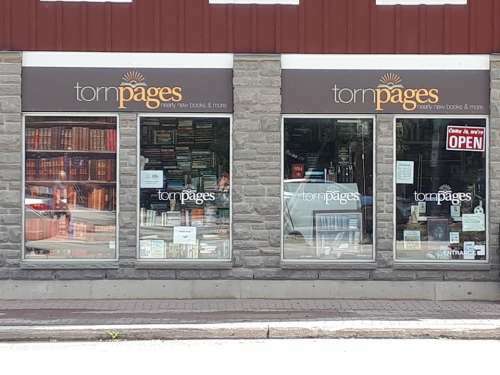 Then in the summer of 2015 I made the big plunge to start a business and now the proud owner of Torn Pages, your nearly new bookstore in Stayner. I’ve also enjoyed the past year serving in the community as a Stayner Lion’s member and as a Director for the Stayner Chamber of Commerce. At TORN PAGES we sell a variety of second hand books. We have all major genres such as fiction, romance, fantasy, science fiction, history, war, children, pre-teen, biographies, western, and many more.... for any inquires please contact Torn Pages by the following below..
All content © Copyright 2019 by Torn Pages.